Description: This playground has it all: treehouse, swimming pool, see-saw, merry-go-round, and more! 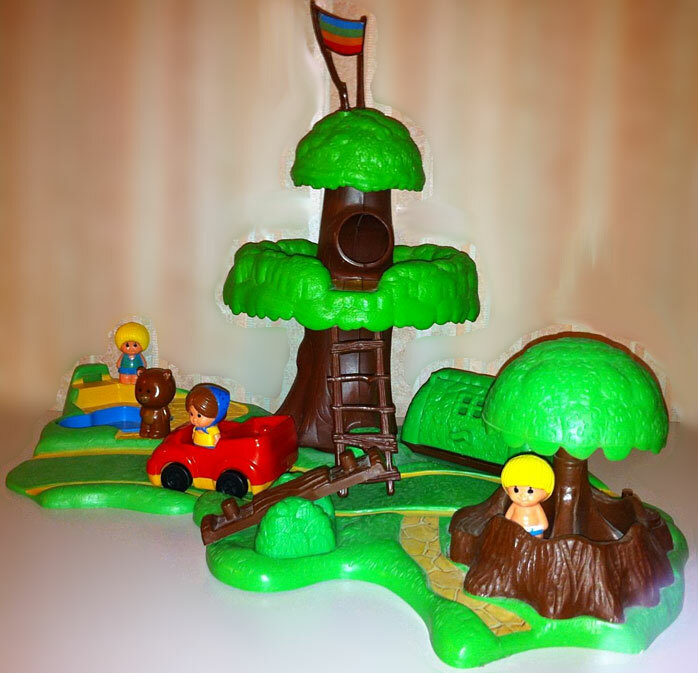 Base 1 (Large w/ Trees) - Green plastic playground based with a "road" in the middle, rock litho path by a merry-go-round tree, and an area for the treehouse. 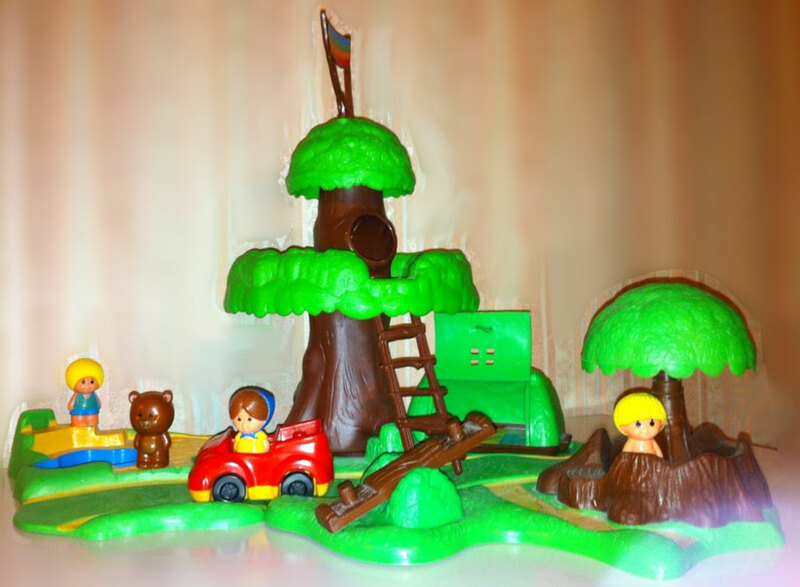 Base 2 (Small with Swimming Pool) - Small green plastic playground based with a short "road" on one side and area for a small swimming pool on the other side. See-Saw - Brown wooden "log" tilting sea-saw with a green leaf-simulated base. 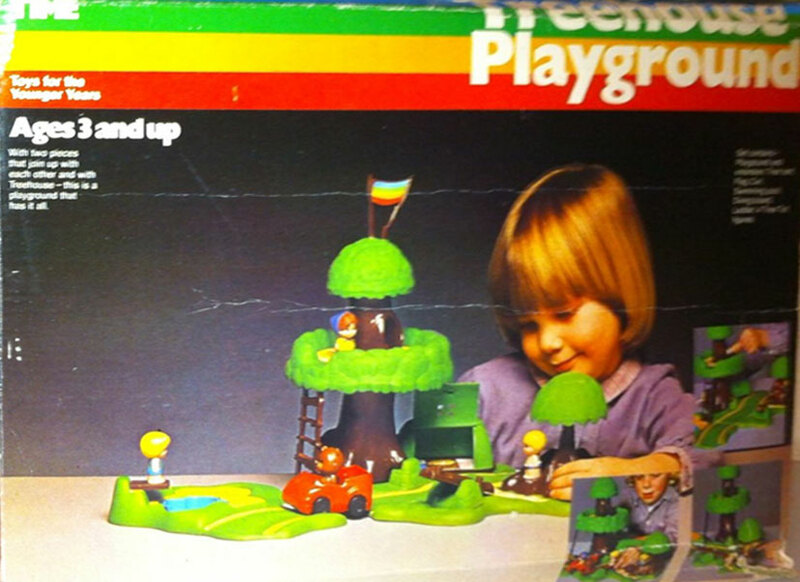 Treehouse - Tree with a round brown trunk in the center, a green "leaf" walkway around the middle, and a rounded green "left" dome top. Top dome holds a rainbow flag on top. Ladder - Brown wood-simulated 5-rung ladder to access the walkway on the treehouse. Tent - Green "domed" tent with a lift-up door on one side. Inside bottom of the tent has a litho of 3 sleeping bags. KTT65 - Woman - Fern Tree Tot!" - Woman with brown hair wearing a blue scarf on her head, yellow shirt, blue pants, and red shoes. KTT85 - Boy - Opal Mountain Tot - Boy with yellow hair, no shoes, and wearing blue shorts shorts and a green/blue striped sleeveless shirt. 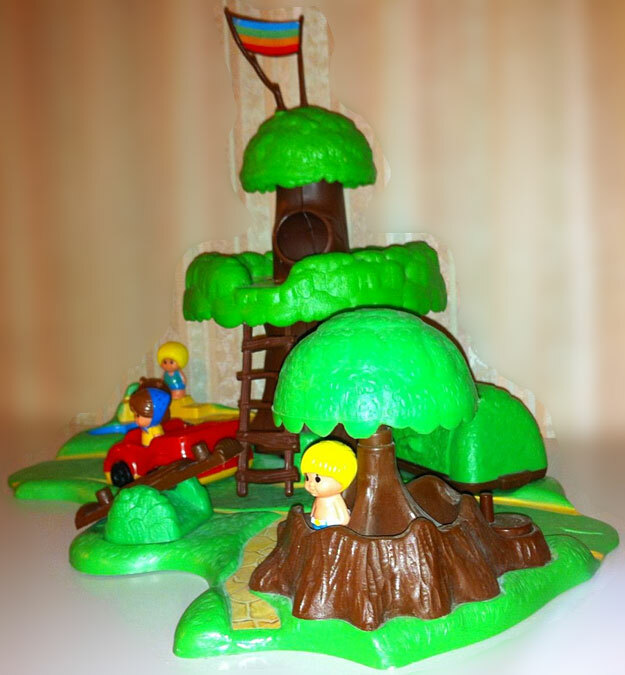 KTT53 - Boy - Chip Tree Tot - Boy with yellow hair wearing blue swim shorts (no shirt, no shoes). KTT86 - Bear - Jasper Mountain Tot - Brown bear with a tan tummy and snout, pink inner ears and pink nose.